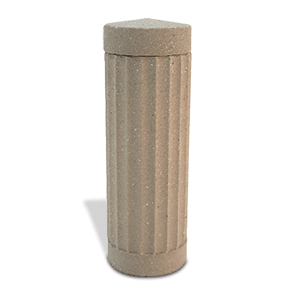 Create a distinguished separation between vehicular and pedestrian areas with a concrete bollard. The fluted column concrete bollard features a unique design with curved stylings allows this fixture to be functional and aesthetically pleasing. Strategically place this bollard across building exteriors, streetscapes, cross walks, park landscapes or with other round bollard styles to enhance outdoor aesthetic while keeping the public safe. Constructed entirely with reinforced concrete, this sturdy, elegant bollard will withstand the rigorous environmental conditions while maintaining its original shape and beauty. This elegantly crafted bollard is available in standard and premium finishes.